Video: Alive Almond Milk?! Do It Yourself! What’s New on the World Mind: What Does Roundup Do to Your Liver? Marcelle, our glorious intern, shows you how to make your own almond milk – alive and vibrant and uniquely yours. Place the syrup, cinnamon, vanilla, and salt into a measuring cup. Whisk it all together. Place the walnuts into a large mixing bowl. Pour the sauce over the walnuts and mix together with a spoon. Take two dehydrator trays with teflex sheets. Spread the walnuts evenly over the sheets. Make sure they are lying flat with plenty of room to breathe. Place into the dehydrator at 115 degrees for 8 hours. These can be stored in an airtight Ziploc bag in the freezer for up to 3 months. Place all of the ingredients into a Vitamix. Blend until creamy smooth. Note: If the dressing is stored in the refrigerator, it will thicken. If it does that, place it back into the Vitamix and blend it again on high using a tamper. The heat from the Vitamix will warm it up and give it a nice consistency. Take the baby beets and slice them with a julienne slicer. Stack the slices and cut them into strips. Rinse the radicchio. Take a sharp paring knife and core the center out by cutting right around the center straight down with the knife. The center should pull right out. Gently remove 6 of the outer leaves by pulling the outermost leaves from the core out. Don’t try to remove the leaves from the top because they will rip and become unusable. Set aside. Take the remaining radicchio and cut it into long slices and place it into a large mixing bowl. Peel all of the carrots in the bag. Take 3 of the carrots and use a vegetable peeler with dual julienne blades. Use the julienne blade to cut the 3 carrots into long strips. Take the remaining carrots and cut them into squares with a chef knife. Cut one side straight. Place the carrot flat side down on a chopping block and cut the other 2 sides. Turn the carrot and cut the remaining side straight. You will then have a square carrot. Repeat the procedure until all of the carrots are squared off. Cut the squared carrots into thin lengthwise slices each. You then have julienne slices. Take the cherries and chop them into medium pieces. Chop the walnuts into small to medium sized pieces. Note: Set aside some of the julienne slices for decorating purposes. Take a large bowl with hot water. Take a chopping block and a roll of paper towels. Take a rice paper wrap and place it into the warm water. Flip the rice wrap over in the water until it reaches a noodle consistency. Remove it from the water and lay the wrap flat on the chopping block. Dab the water off with a paper towel. Place the carrot strips, beets, micro greens, baby greens, sprinkled cherries and nuts in a line down the center of the wrap. Fold the end of the wrap that is closest to you and roll it over the top of the vegetables. Then take both sides and fold them over the top of the vegetables. Lastly, roll the other side over the whole thing. The wrap will automatically stick to itself like glue. Repeat the procedure for all of the wraps. Makes 6 to 8 wraps. Take the radicchio leaves that you set aside. Take a large mixing bowl and fill it with ice water. Cut the outer portion of the leaves into strips. Leave the whole leaf intact by starting your cut ½ inch away from the center with your knife. Go all the way around the leaf creating a fan like appearance. Place the leaf upside down in the ice water. This will keep it fresh and curl the ends. Repeat the procedure for all the leaves. Remove the leaves from the water and place them upside down on a paper towel and pat dry. Take 4 slices of julienne carrot and put 3 of them together. Tie them up with the other slice in the center with a knot. Take a decorative platter. Place two of the radicchio leaves, centers together, facing up. The fans will be at either end of the platter. This will form a boat for the wrap. Take some microgreens and make a bed of them in the center of the boat. Put one wrap on top of the microgreens. Sprinkle some walnut and cherry pieces around the wrap. Place the julienne carrot fan on top of the wrap. Place some chocolate dressing and put it into a squirt bottle. Drizzle the chocolate dressing around the boat on the platter. Drizzle the dressing over the wrap as well. Amaze family and friends at your Thanksgiving table with jujubes. These are Chinese date apples. A unique flavor and taste. Grown for you by Judith Redmond with Full Belly Farms, an outstanding family farmer here in California. At Gettysburg, Abe Lincoln said “…this nation shall have a new birth of freedom…” We have named our creation “a new birth” signifying our quiet confidence in your ability to realize Lincoln’s prophecy, of renewal and restoration. In our understanding, brothers and sisters, the task of your generation is one of redemption – to heal this great land. Accordingly, we celebrate you with a sea of chocolate. You have our vote! Our Cherry Chocolate Butter brings together organic almonds, cacao, cherries, honey, vanilla, coconut oil and a dash of salt for a profound, chocolatey flavor. Both the organic almonds and cherries are grown by California family farmers. Use this decadent topping on fruit slices or ice cream. (Mercola) If you started your day with a bowl of oatmeal, Cheerios or even organic cage-free eggs, there’s a good chance you consumed a small amount of glyphosate residue along with it. Likewise, if you’ve recently snacked on popular brands of crackers, tortilla chips and pita chips, or consumed beer or wine. (Mercola) While the controversy over whether organically grown food is healthier lingers, scientific research continues to demonstrate the health benefits to both humans and the environment of growing and consuming organic foods. Food grown in healthier soil, with natural fertilizers and no harmful chemicals, is quite simply more nutritious and less dangerous to your health. Detractors of organic farming rest on a meta-analysis published in 2012 by Stanford University, which found similar nutrients in both organically growth produce and those laden with pesticides and insecticides. That same study did admit organic foods were not burdened with antibiotic-resistant bacteria and pesticide residue, but stated these were the only benefits. More recent analyses of organic foods also found similar levels of nutrients between organic and pesticide-treated crops, with lower pesticide residue on organic foods. However, the more recent studies also found lower levels of cadmium, a known carcinogen, and higher levels of antioxidants. Yellowstone National Park has captured nearly 400 of the country’s last wild buffalo. The world’s first national park intends to consign America’s first national mammal to slaughter, all in the name of appeasing the unfounded fears and deep-rooted prejudices of Montana’s cattle industry. Montana Governor Steve Bullock’s executive order remains in place and is stalling the buffalo’s slaughter. Unfortunately, it is not preventing their capture. We are asking everyone to call #307-344-2002 and insist that Yellowstone honor the national mammal by releasing all captured buffalo. We also need you to contact Governor Bullock and Montana and urge them to repeal MCA 81-2-120 and respect wild buffalo like wild elk in Montana. As Yellowstone officials are busy trapping America’s national mammal for slaughter, those buffalo who are able to slip by the capture facility are being gunned down just a mile north of the trap, just acrossYellowstone’s border. This so-called hunt is being driven by the same forces who crafted the Interagency Bison Management Plan: Montana livestock interests. 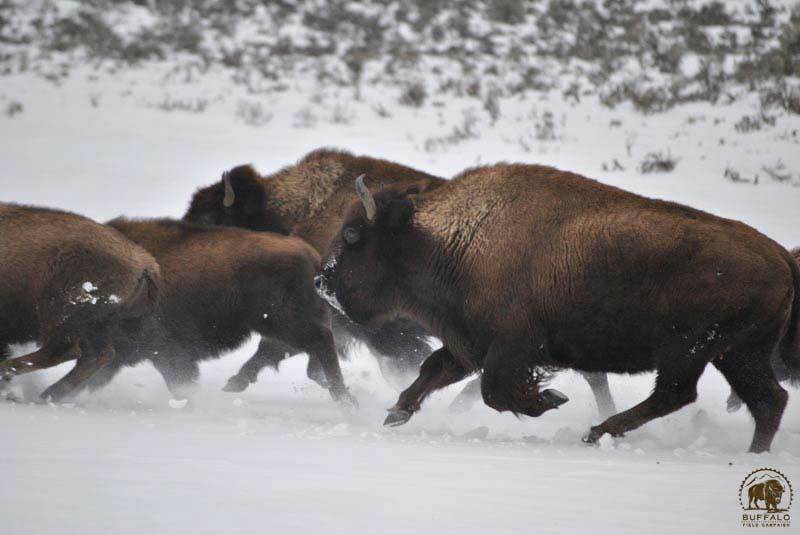 Though some hunters have been unsuccessful because Yellowstone is trapping their prey, more than 200 buffalo have already been hunted. Hunting animals from a vulnerable and diminishing population on an incredibly crowded landscape offers the buffalo very little chance of survival, and puts hunters in competition with hundreds of others as they race against the trap. It is a recipe for extermination. While some hunters don’t seem to mind being part of such chaos, many are growing increasingly uncomfortable, if not disgusted, with the whole management scheme. The demand for more buffalo on a larger landscape is growing, especially from within the tribes. There have even been a few hunters who received tags to kill buffalo, but after visiting BFC’s web site and learning the truth, made the decision to not hunt. As this latest BFC video shows, Montana’s buffalo hunt is yet another means of slaughtering this national treasure.